This article is about the international relations theory. For other uses, see Realism. 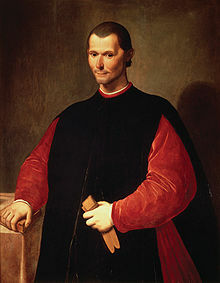 Niccolò Machiavelli's work The Prince of 1532 was a major stimulus to realist thinking. Realism is a school of thought in international relations theory, theoretically formalising the Realpolitik statesmanship of early modern Europe. Although a highly diverse body of thought, it can be thought of as unified by the belief that world politics ultimately is always and necessarily a field of conflict among actors pursuing power. Crudely, realists are of three kinds in what they take the source of ineliminable conflict to be. Classical realists believe that it follows from human nature, neorealists focus upon the structure of the anarchic state system; neoclassical realists believe that it is a result of a combination of the two and certain domestic variables. Realists also disagree about what kind of action states ought to take to navigate world politics and neorealists are divided between defensive realism and offensive realism. Realists have also claimed that a realist tradition of thought is evident within the history of political thought all the way back to antiquity to Thucydides. Jonathan Haslam characterizes realism as "a spectrum of ideas." Regardless of which definition is used, the theories of realism revolve around four central propositions: that states are the central actors in international politics rather than individuals or international organizations, that the international political system is anarchic as there is no supranational authority that can enforce rules over the states, that the actors in the international political system are rational as their actions maximize their own self-interest, as well as that all states desire power so that they can ensure their own self-preservation. Realism is often associated with Realpolitik as both are based on the management of the pursuit, possession, and application of power. Realpolitik, however, is an older prescriptive guideline limited to policy-making (like foreign policy), while realism is a particular paradigm, or wider theoretical and methodological framework, aimed at describing, explaining and, eventually, predicting events in the international relations domain. The theories of Realism are contrasted by the cooperative ideals of liberalism. Realism is one of the dominant strains of thought in modern foreign policy. As an academic pursuit, realism is not tied to ideology; it does not favor any particular moral philosophy, nor does it consider ideology to be a major factor in the behavior of nations. Priorities of realists have been described as "Machiavellian", with the primary focus being increasing the relative power of one's own nation over others. Realism is a tradition of international theory centered upon four propositions. The international system is anarchic. No actor exists above states, capable of regulating their interactions; states must arrive at relations with other states on their own, rather than it being dictated to them by some higher controlling entity. The international system exists in a state of constant antagonism (anarchy). States are the most important actors. States tend to pursue self-interest. Groups strive to attain as many resources as possible (relative gain). The primary concern of all states is survival. States build up military to survive, which may lead to a security dilemma. Realists think that mankind is not inherently benevolent but rather self-centered and competitive. This perspective, which is shared by theorists such as Thomas Hobbes, views human nature as egocentric (not necessarily selfish) and conflictual unless there exist conditions under which humans may coexist. It is also disposed of the notion that an individual's intuitive nature is made up of anarchy. In regards to self-interest, these individuals are self-reliant and are motivated in seeking more power. They are also believed to be fearful. This view contrasts with the approach of liberalism to international relations. The state emphasises an interest in accumulating power to ensure security in an anarchic world. Power is a concept primarily thought of in terms of material resources necessary to induce harm or coerce other states (to fight and win wars). The use of power places an emphasis on coercive tactics being acceptable to either accomplish something in the national interest or avoid something inimical to the national interest. The state is the most important actor under realism. It is unitary and autonomous because it speaks and acts with one voice. The power of the state is understood in terms of its military capabilities. A key concept under realism is the international distribution of power referred to as system polarity. Polarity refers to the number of blocs of states that exert power in an international system. A multipolar system is composed of three or more blocs, a bipolar system is composed of two blocs, and a unipolar system is dominated by a single power or hegemon. Under unipolarity realism predicts that states will band together to oppose the hegemon and restore a balance of power. Although all states seek hegemony under realism as the only way to ensure their own security, other states in the system are incentivised to prevent the emergence of a hegemon through balancing. States employ the rational model of decision making by obtaining and acting upon complete and accurate information. The state is sovereign and guided by a national interest defined in terms of power. Since the only constraint of the international system is anarchy, there is no international authority and states are left to their own devices to ensure their own security. Realists believe that sovereign states are the principal actors in the international system. International institutions, non-governmental organizations, multinational corporations, individuals and other sub-state or trans-state actors are viewed as having little independent influence. States are inherently aggressive (offensive realism) and obsessed with security (defensive realism), and that territorial expansion is only constrained by opposing powers. This aggressive build-up, however, leads to a security dilemma whereby increasing one's security may bring along even greater instability as an opposing power builds up its own arms in response (an arms race). Thus, security becomes a zero-sum game where only relative gains can be made. Realists believe that there are no universal principles with which all states may guide their actions. Instead, a state must always be aware of the actions of the states around it and must use a pragmatic approach to resolve problems as they arise. The ideas behind George F. Kennan's work as a diplomat and diplomatic historian remain relevant to the debate over American foreign policy, which since the 19th century has been characterized by a shift from the Founding Fathers' realist school to the idealistic or Wilsonian school of international relations. In the realist tradition, security is based on the principle of a balance of power and the reliance on morality as the sole determining factor in statecraft is considered impractical. According to the Wilsonian approach, on the other hand, the spread of democracy abroad as a foreign policy is key and morals are universally valid. During the Presidency of Bill Clinton, American diplomacy reflected the Wilsonian school to such a degree that those in favor of the realist approach likened Clinton's policies to social work. According to Kennan, whose concept of American diplomacy was based on the realist approach, such moralism without regard to the realities of power and the national interest is self-defeating and will lead to the erosion of power, to America's detriment. Realists often hold that statesmen tend towards realism whereas realism is deeply unpopular among the public. When statesmen take actions that divert from realist policies, academic realists often argue that this is due to distortions that stem from domestic politics. However, some research suggests that realist policies are actually popular among the public whereas elites are more beholden to liberal ideas. The genealogy of realism as international relations, although acknowledging antecedents, gets down to serious business with Machiavelli, moving on to theorists of sovereignty and apologists for the national interest. It is present in its early modern forms with Hobbes's Leviathan (1651). Modern realism began as a serious field of research in the United States during and after World War II. This evolution was partly fueled by European war migrants like Hans Morgenthau, whose work Politics Among Nations is considered a seminal development in the rise of modern realism. The English school holds that the international system, while anarchical in structure, forms a "society of states" where common norms and interests allow for more order and stability than that which may be expected in a strict realist view. Prominent English School writer Hedley Bull's 1977 classic, The Anarchical Society, is a key statement of this position. Hedley Bull – argued for both the existence of an international society of states and its perseverance even in times of great systemic upheaval, meaning regional or so-called "world wars"
Neorealism derives from classical realism except that instead of human nature, its focus is predominantly on the anarchic structure of the international system. States are primary actors because there is no political monopoly on force existing above any sovereign. While states remain the principal actors, greater attention is given to the forces above and below the states through levels of analysis or structure and agency debate. The international system is seen as a structure acting on the state with individuals below the level of the state acting as agency on the state as a whole. While neorealism shares a focus on the international system with the English school, neorealism differs in the emphasis it places on the permanence of conflict. To ensure state security, states must be on constant preparation for conflict through economic and military build-up. It is a synthesis of the neorealist and the classical realist approaches. Gideon Rose is responsible for coining the term in a book review he wrote. While neoclassical realism has only been used for theories of foreign policy so far, Randall Schweller notes that it could be useful to explain certain types of political outcomes as well. Neoclassical realism is particularly appealing from a research standpoint because it still retains a lot of the theoretical rigor that Waltz has brought to realism, but at the same time can easily incorporate a content-rich analysis, since its main method for testing theories is the process-tracing of case studies. Several scholars, including Mark Laffey at the School of Oriental and African Studies, and Ronald Osborn at the University of Southern California, have argued for the idea of a "Left Realism" in IR theory with particular reference to the work of Noam Chomsky. Both Laffey and Osborn have suggested in separate articles in Review of International Studies that Chomsky’s understanding of power in the international sphere reflects the analytical assumptions of classical realism combined with a radical moral, normative or "Left" critique of the state. Some see a complementarity between realism and constructivism. Samuel Barkin, for instance, holds that "realist constructivism" can fruitfully "study the relationship between normative structures, the carriers of political morality, and uses of power" in ways that existing approaches do not. Similarly, Jennifer Sterling-Folker has argued that theoretical synthesis helps explanations of international monetary policy by combining realism’s emphasis of an anarchic system with constructivism's insights regarding important factors from the domestic level. Scholars such as Oded Löwenheim and Ned Lebow have also been associated with realist constructivism. Democratic peace theory advocates also that realism is not applicable to democratic states' relations with each another as their studies claim that such states do not go to war with one another. However, realists and proponents of other schools have critiqued both this claim and the studies which appear to support it, claiming that its definitions of "war" and "democracy" must be tweaked in order to achieve the desired result. Robert Gilpin developed the theory of hegemonic stability theory within the realist framework, but limited it to the economic field. Niall Ferguson remarked that the theory has offered insights into the way that economic power works, but neglected the military and cultural aspects of power. The term refers to the theory or advocacy of federal political orders, where final authority is divided between sub-units and a centre. Unlike a unitary state, sovereignty is constitutionally split between at least two territorial levels so that units at each level have final authority and can act independently of the others in some area. Citizens thus have political obligations to two authorities. The allocation of authority between the sub-unit and centre may vary. Typically the centre has powers regarding defence and foreign policy, but sub-units may also have international roles. The sub-units may also participate in central decision-making bodies. The basic idea behind federalism is that a unifying relationship between states should be established under a common system of law. Conflict and disagreement should be resolved through peaceful means rather than through coercion or war. Its most important aspect is in recognizing that different types of institutions are needed to deal with different types of political issues. Post-realism suggests that realism is a form of social, scientific and political rhetoric. It opens rather than closes a debate about what is real and what is realistic in international relations. ^ Goodin, Robert E. (2010). The Oxford Handbook of International Relations. Oxford: Oxford University Press. p. 132. ISBN 978-0-19-958558-8. ^ Goodin, Robert E. (2010). The Oxford Handbook of International Relations. Oxford: Oxford University Press. p. 133. ISBN 978-0-19-958558-8. ^ Garrett Ward Sheldon (2003). The History of Political Theory: Ancient Greece to Modern America. Peter Lang. p. 251. ISBN 978-0-8204-2300-5. ^ Jack Donnelly, "The Ethics of Realism", in Christian Reus-Smit, Duncan Snidal (eds. ), The Oxford Handbook of International Relations, Oxford University Press, 2008, p. 150. ^ Harris, Robin. "De Gaulle understood that only nations are real". The Spectator. ^ But see Kahler, Miles. Rationality in International Relations International Organization, Vol. 52, No. 4, International Organization at Fifty: Exploration and Contestation in the Study of World Politics (Autumn, 1998), pp. 919-941 © 1998 MIT Press. ^ Rogan, Tom. "Putin is a realist, not a Russian neoconservative — there's a difference". Washington Examiner. ^ "The Tragedy of Great Power Politics | W. W. Norton & Company". books.wwnorton.com. Retrieved 2016-01-14. ^ "Neoclassical Realism, the State, and Foreign Policy". Cambridge University Press. Retrieved 2016-01-14. ^ Drezner, Daniel W. (2008-03-01). "The Realist Tradition in American Public Opinion". Perspectives on Politics. null (1): 51–70. CiteSeerX 10.1.1.552.8386. doi:10.1017/S1537592708080067. ISSN 1541-0986. ^ Jean Bethke Elshtain (1992). Just War Theory. NYU Press. p. 261. ISBN 9780814721872. ^ Baylis, J & Smith, S & Owens, P, The Globalization of World Politics, Oxford University Press, US, p. 95. ^ a b Gideon Rose, "Neoclassical Realism and Theories of Foreign Policy", World Politics, Vol. 51, No. 1, pp. 144–172. ^ Randall L. Schweller, "The Progressiveness of Neoclassical Realism", pp. 311–347 in Colin Elman and Miriam Fendius Elman eds., Progress in International Relations Theory, (Cambridge, Mass. : MIT Press, 2003). ^ See, for example, Ronald Osborn, "Noam Chomsky and the Realist Tradition", Review of International Studies, Vol. 35, No. 2, 2009"
^ Barkin, J.Samuel (2003-09-01). "Realist Constructivism". International Studies Review. 5 (3): 325–342. doi:10.1046/j.1079-1760.2003.00503002.x. ISSN 1468-2486. ^ Jennifer Sterling-Folker, Theories of International Cooperation and the Primacy of Anarchy: Explaining U.S. International Monetary Policy-Making after Bretton Wood, State University of New York Press, 2002. ^ Matt Sleat, Legitimacy in Realist Thought: Between Moralism and "Realpolitik", Political Theory, Vol. 42, No. 3 (June 2014), pp. 314-337. ^ “Hegemony or Empire?” Foreign Affairs, 82/5, (2003): p 161. Pashakhanlou, Heydarian Arash. Realism and Fear in International Relations: Morgenthau, Waltz and Mearsheimer Reconsidered. London: Palgrave, 2016. ""Political Realism"". Internet Encyclopedia of Philosophy.